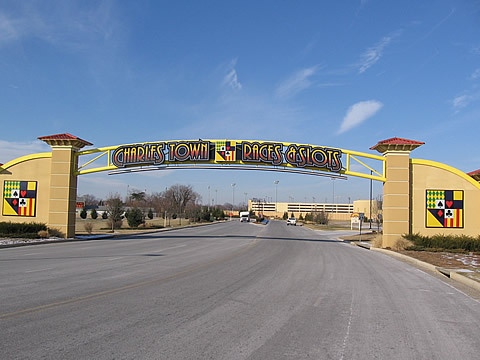 Charles Town Races & Slots is a gambling facility owned by Penn National Gaming and located in Charles Town, West Virginia. It features a six furlong thoroughbred horse racing facility that is home of the West Virginia Breeders' Classic. It also contains over 5,000 Slot machines, which help to generate 1,400 jobs for the surrounding community. In 2008, the track inaugurated The Sprint Festival, four open stakes worth a total of $500,000. These are the 4 1/2 furlong $200,000 Charles Town Invitational Dash for colts and geldings three-years-old and up, the $100,000 Lady Charles Town for 3-year-old fillies at 4 1/2 furlongs, the $100,000 West Virginia Sprint Derby for 3-year-olds at 4 1/2 furlongs, and the $100,000 Red Legend Stakes for 3-year-olds at seven furlongs. In 2009, it inaugurated the Charles Town Classic for older horses running a distance of one and 1/8th mile. The purse for this race is determined by the graded status of the winner. Also on the property is a 150-room hotel, The Inn at Charles Town, and several dining facilities, including a food court, track side restaurant, and the Skyline Terrace. On June 9, 2007 local voters defeated a referendum to permit expansion of the facility to include dice and card "table games". On December 5th, 2009, a second referendum was held on table games and this time voters approved the referendum to allow table games at the venue.